In the summer of 2010, I went kayaking on the Huntington Harbor with a colorful group of scientists. We were on the coast of New York State for the week as part of the PopTech Institute's Science Fellows Program taking place at the Cold Spring Harbor Laboratory, a stately 125-year-old research and education institution at the forefront of molecular biology and genetics. Beth Shapiro describes the science of de-extinction at the 2010 PopTech Conference. Beth Shapiro has the coolest job ever. A self-proclaimed molecular paleontologist — or paleogeneticist — Beth looks more like a stunt double for the Icelandic pop singer Björk than a woman who does what she does for a living. As part of the 2010 PopTech Science Fellows program, Beth Shapiro describes her cutting-edge DNA research, I illustrated some of the fun details. Her research is helping us make informed decisions about how to preserve the species that are currently under threat. Shapiro and her team collect both partial and fully-preserved giant mammals from the Pleistocene epoch — giant sloths, giant wolves, giant bears, giant beavers (that one always gets a chuckle), and of course giant wooly mammoths. So, naturally, I wanted her to take me with her on the hunt! 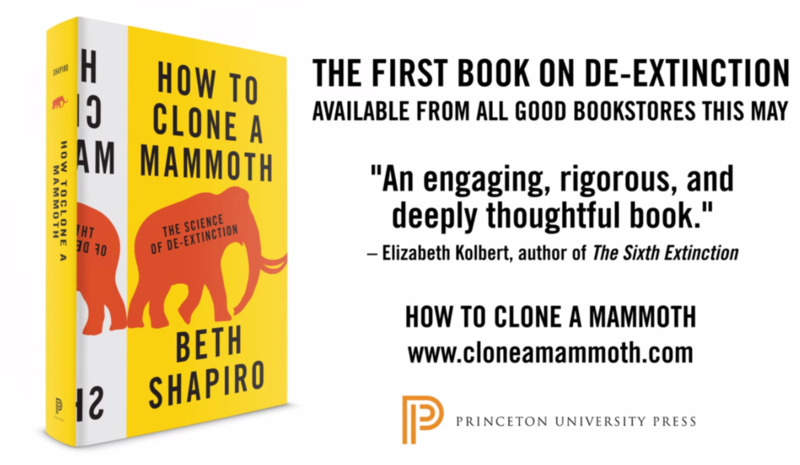 Well, that is what Shapiro has done in her new book, How to Clone a Mammoth: The Science of De-Extinction; she takes the reader on the hunt in Beringia — also called “Bering Land Bridge” — where these giants roamed the dry, grassy plain that once connected Asia with North America during periodic ice ages. Shapiro on the hunt for bones at the site of a hydraulic gold mining operation in Alaska. In her hands-on research, Shapiro digs in dirt and hauls bones around, rides in a rustbucket Russian helicopter, camps among a gabillion mosquitos, and labors in the lab to piece together chopped up strands of DNA. In the fall of 2014, I ran into Beth and her mammoth bones again. This time, she was one of the presenters for the National Academy of Sciences and The Kavli Foundation Frontiers of Science program in Irvine, California. This symposium brings together some of the very best young scientists to discuss exciting advances and opportunities in their fields. I was fortunate enough to scribe for both her National Academies of Science public presentation, part of the Distinctive Voices lecture series. Beth Shapiro and Peter Durand at the National Academy of Sciences in Irvine, California. Once again, Beth's presentation, her personality, and her message were a hit. She presented to a full auditorium, walking the audience through the challenges and possibilities that cloning a mammoth make available, namely, the science of de-extinction. So in November of 2014, we started the process. Along with the team at Princeton University Press, Beth began working on the script and the Alphachimp team began coaching her on how to record a voiceover. No easy task! Shapiro is now associate professor of ecology and evolutionary biology at the University of California, Santa Cruz. She also runs a busy research lab, carries a full teaching load, parents two small children, and is in full-scale promotion mode for the book's publication. At one point, Beth lost her voice giving talks, teaching, and catching cold from her kids. Initial concept sketches completed on an iPad. In parallel with crafting the script and voiceover, the Alphachimp team worked through sketching out the ideas and illustrations. A preliminary sketch showing image placement and the camera movements across the painting. Bring these creatures to life! In the end, we created a watercolor painting (with some animation sprinkled in) that allows Beth's voice to express the wonder of the science and to inspire audiences to read the rest of this amazing story.